It’s winter time, which means that many of us have already been or will be sick. And clearly, the meal of choice when sick is soup. So, instead of spending money at the store for cans of soup of dubious quality, you can easily make soup at home. Homemade soup can be packed into the freezer in reusable containers – perfect for weeks when you are busy or sick. 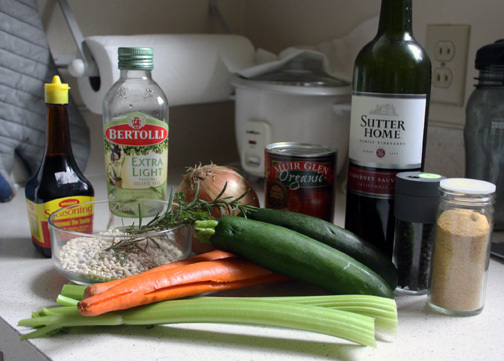 One of my favorite soups to make is this vegetable barley soup. It’s cheap, delicious and nutritious. It has a lot of vegetables, some hearty grains, and a rich broth that’s slightly spicy. All that good stuff you really want when you’re sick. I hope this one keeps you warm and happy this winter! 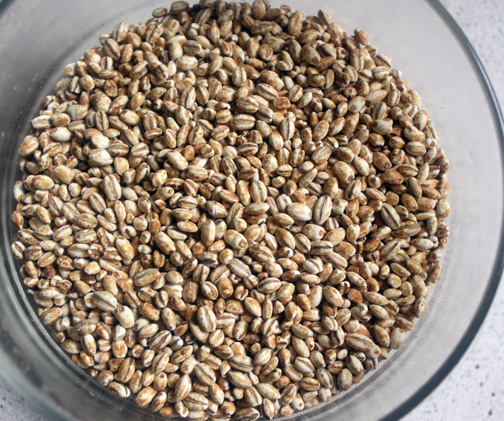 Put the barley into a medium pot, and toast the barley on medium high, stirring constantly so that it does not burn. You want the barley to be light brown and aromatic. Add 3 cups of stock and bring to a boil. 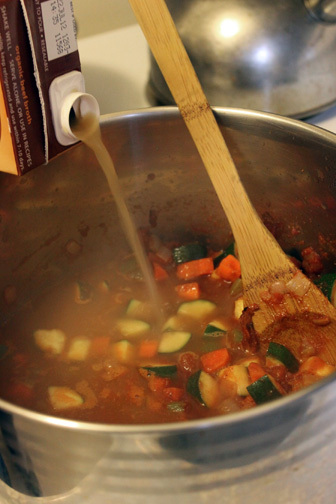 (Add ½ tsp to 1 tsp of salt if you are using homemade stock. Store bought stocks tend to have a lot of salt added. The idea is to season each stage of the cooking process. Otherwise you will have a flavorful broth and bland barley. No good.) Add the sachet and the dried shitakes, if using them. 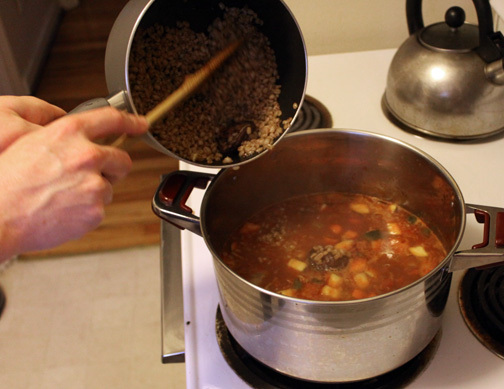 Cover the pot, turn down to medium low, and simmer for 60 minutes or until barley is done. note on dried shitakes: Dried shitakes are common in Chinese and Japanese cooking, and can be found at Asian markets or in the Asian aisle of your grocery store. When reconstituted in hot water, their earthy scent is strong and distinctive, and can quickly overwhelm a dish. Used in moderation, however, dried shitakes contribute a smokey depth. A much cheaper alternative to using, say, dried porcini muchrooms, which are used to the same effect. Heat an 8 qt stainless steel stock pot on medium. Add the oil. 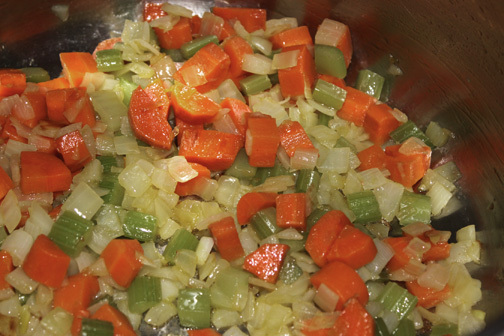 Slowly sweat the vegetables until the onion turns transluscent and the vegetables are aromatic. Add the zucchini, and coat with oil. Turn the heat up to medium high. Sprinkle in the garlic powder, 3 pepper blend and ½ tsp of salt. 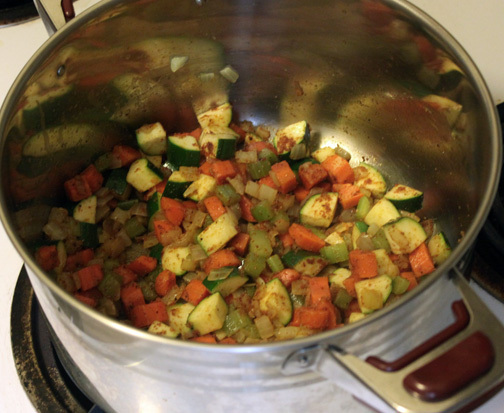 Mix until the spices evenly coat the vegetables, and starts to develop on the bottom of the pot. 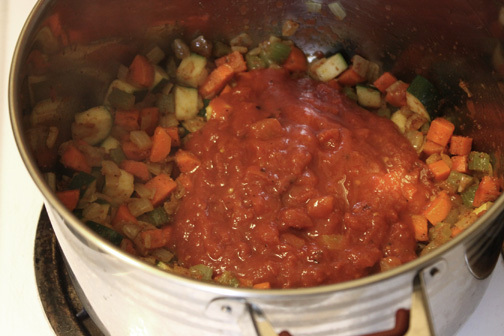 Deglaze the pan with the canned tomatoes. Turn the heat up to high, and let the juice from the tomatoes cook off. This should create a second layer of fond. Deglaze a second time with soy sauce (or whatever you’re using) and red wine. Add in the remaining 5 cups of stock. Bring to a boil, then simmer for another 10 or 15 minutes. The onion, carrots and celery will be mostly cooked at this point, so you only need to simmer until the zucchini is mostly done. Add the barely, sachet and any remaining cooking liquid in to the stock pot. 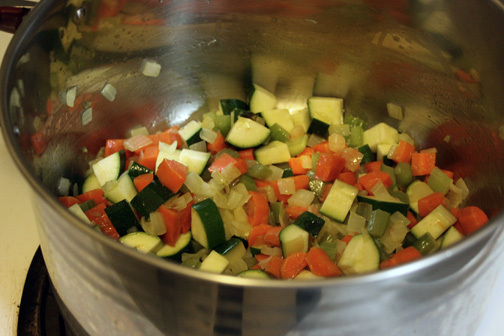 Simmer for 5 to 10 minutes to combine the flavors and finish cooking the zucchini. The soup is now ready to eat. I hope you enjoy this soup, and that it makes you feel a little better when you’re under the weather. If you make this soup, let me know how it turns out. I’d love to get some feedback on the recipe! For what it's worth, I think actually finding the Maggi seasoning for this recipe is well worth it, and it's way better than the other substitutions. Although, I guess I've never had it made with Worcestershire. Also, I'm excited for the day you can cross-reference this page with posts about Asian market shopping and making your own stock at home. 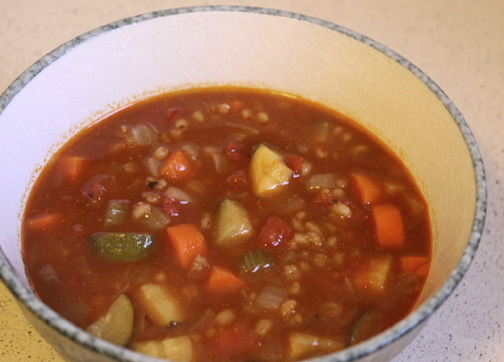 You are currently reading Vegetable Barley Soup at The Evolution of Eating.